Jefferson County Pet Food Pantry : We NEED More Pet Food!! Here Are Our Drop Off Locations! We NEED More Pet Food!! Here Are Our Drop Off Locations! So, due to Father's Day falling on the 3rd Sunday of the month, our pet food distribution for June will be a week early (June 12th). That being said...we SERIOUSLY need to replenish our pet food stock. We REALLY need 2,000 lbs of dry dog, 1,000 lbs of dry cat and we need canned cat food. 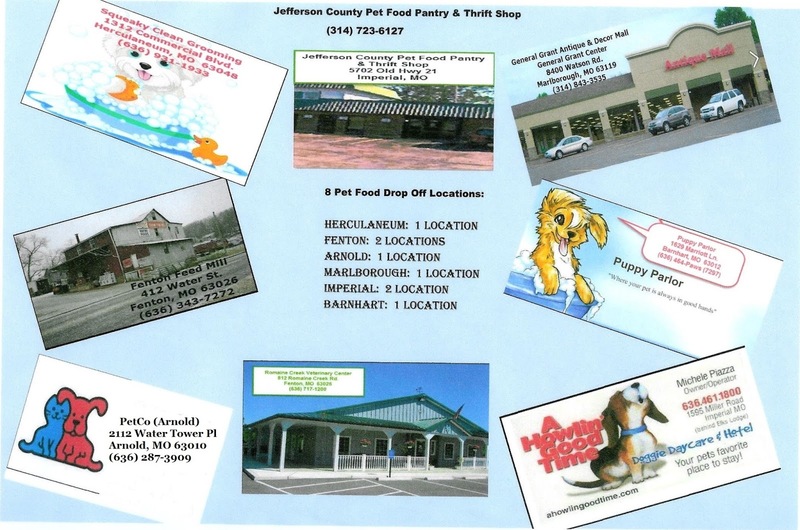 Attached is a list of our drop off locations, PLEASE help us help the less fortunate pet owners in our community by donating food or monetary donations and SHARE with your friends? We want to keep pets at home and out of the shelter! !